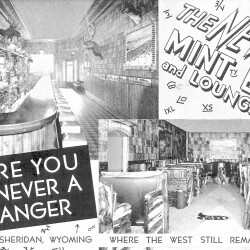 Known for years as the gathering place for cowboys, ranchers and dudes to tip a cold one and socialize, the Mint was completely redecorated in the late 40’s in the rustic style seen today. Knotty pine paneling and gnarled pine burls make up the back bar and the booths are made from cedar. Much of the wild game in the bar was a result of Mac and local entrepreneur Sam Mavrakis’ trip to the Yukon in the 50’s. The two Dall Sheep, along with the black Timber Wolf, Wolverine, and two Caribou all came from one 18 day hunting trip. The remainder, including the deer, antelope and elk, came from the Sheridan area.